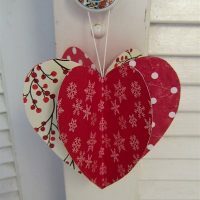 You will be creating heart ornaments, a canvas heart wall hanging, a couple of Valentines and a fun takeout treat box! These projects are for anyone in grades 6-8. All students choose their own creative outlet and work from there. Items will be yours to take home and possibly use as a gift. All supplies are included in your participation fee. STUDENTS CAN ATTEND IN CONJUNCTION WITH EN-GEDI: They will check in Room #18 before coming to program. They can be picked up after class or from En-Gedi.